"Mary Oliver moves by instinct, faith, and determination. She is among out finest poets, and still growing." "These are life-enhancing and redemptive poems that coax the sublime from the subliminal." "It has always seemed, across her 15 books of poetry, five of prose and several essays and chapbooks, that Mary Oliver might leave us at any minute. Even a 1984 Pulitzer Prize couldn't pin her to the ground. She'd change quietly into a heron or a bear and fly or walk on forever. Her poems contain windows, doors, transformations, hints on how to escape the body; there's the 'glamour of death' and the 'life after the earth-life.' This urge to be transformed is yoked to a joy in this moment, this life, this body. 'Every day I walk out into the world / to be dazzled, then to be reflective,' she writes in 'Long Afternoon at the Edge of Little Sister Pond.' 'I think there isn't anything in this world I don't / admire,' she writes in 'Hum'…The new poems teem with creation: ravens, bees, hawks, box turtles, bears. The landscape is Thoreauvian: ponds, marsh, grass and cattails; New England's 'salt brightness'; and fields in 'pale twilight.'" "I think of Oliver as a fierce, uncompromising lyricist, a loyalist of the marshes. Hers is a voice we desperately need." In the Media Read a Seattle Post Intelligencer interview with Beacon Press Director Helene Atwan regarding Mary Oliver’s sold-out appearance in Seattle. From February 4, 2008. A full review of Mary Oliver's Seattle appearance from the Seattle Post Intelligencer ran February 5, 2008. “Books of poetry, unless they’re written by someone like Jewel, rarely make the Times best-seller list. The Web site poetryfoundation.org, however, prints a weekly poetry list, with numbers from Nielsen BookScan. 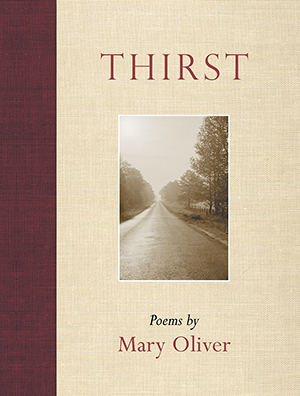 As this issue was going to press, Mary Oliver had each of the top three spots with her books Thirst, Why I Wake Early: New Poems and New and Selected Poems: Volume One.